Sharks can live to be at least 272 years old in the Arctic seas, and scientists say one recently caught shark may have lived as long as 512 years. That's according to a study published Thursday in the journal Science that says Greenland sharks can live longer than any other known animal advanced enough to have a backbone. Until now, the record-holder for the oldest vertebrate was the bowhead whale, known to have lived up to 211 years. 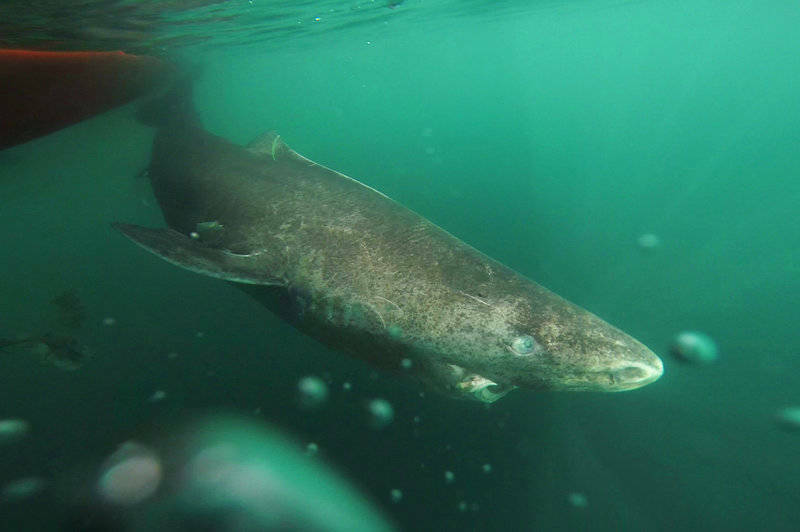 The Greenland shark, a massive carnivore that can be more than 16 feet long, hasn't been studied much, and its life in the cold northern waters remains largely mysterious. Julius Nielsen, at the University of Copenhagen in Denmark, says that there had been some hints that Greenland sharks grow very slowly, perhaps less than a centimeter per year. That suggested the huge sharks might be ancient. "We only expected that the sharks might be very old," says Nielsen. "But we did not know in advance. And it was, of course, a very big surprise to learn that it was actually the oldest vertebrate animal." 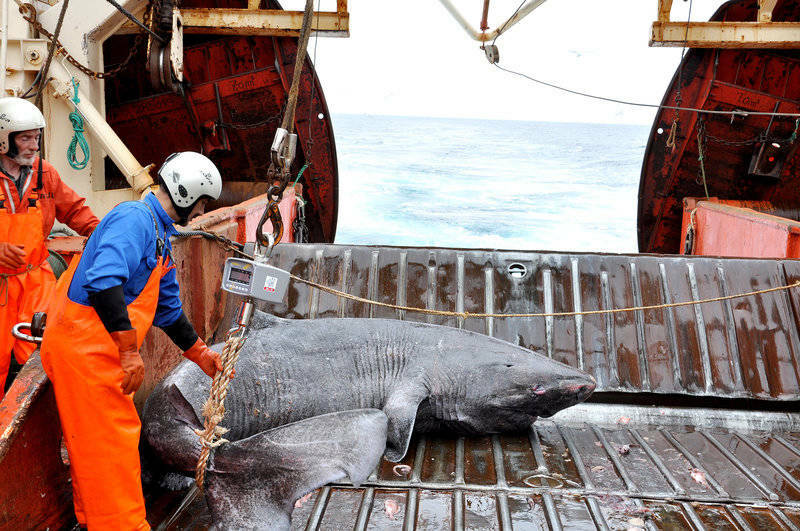 He and some colleagues obtained 28 female Greenland sharks taken by research vessels as unintended bycatch from 2010 to 2013. The researchers then used radiocarbon dating techniques on the lenses of the sharks' eyes. There's a bit of uncertainty associated with the age estimates, but Nielsen says the most likely age for the oldest shark they found was about 390 years. "It was with, 95 percent certainty, between 272 and 512 years old," he says. The researchers believe these sharks reach sexual maturity at about the age of 150 years. "It's a fascinating paper and certainly moves back the vertebrate longevity record by a substantial amount," says Steven Austad, who studies the biology of aging at the University of Alabama at Birmingham. "Even if you look at the low end of their estimate — 272 years — that's still substantially longer than any other documented vertebrate." He says there are lots of anecdotal accounts of long-lived turtles and fish, but this beats those by a long shot. The Greenland shark's lifespan may really only be surpassed by that of the ocean quahog. These clams have annual growth rings on their shell, and scientists have found that they can live as long as 507 years. The Greenland shark, the bowhead whale, and the oldest ocean quahogs spend their long lives in cold northern waters, notes Austad, suggesting that low temperatures might have something to do with their unusual longevity. "I don't think that cold is the whole story," says Austad. "It's probably playing a role. But my guess is there are plenty of short-lived animals that are swimming around with this shark." Still, he says, just imagine what it would be like to have muscles, like these sharks, that have been working nonstop since the time of the Pilgrims. "There's something going on in those muscles that we'd very much like to know about," says Austad. He notes that Greenland sharks would not be easy to study in the lab, but perhaps people could study shark cells grown in a dish. "Probably whatever sort of physiological tricks the sharks have to live that long, and the quahogs have to live that long, they're probably something that humans don't have," says Austad. "But it's something that, if we discover what it is, we might be able to adapt it to human use." He's been studying the quahog, which has a beating heart, and whenever doctors who specialize in geriatrics stop by, he likes to hand them a 200-and-something-year-old clam and tell them they're holding a beating heart that's older than any heart they'll encounter in their entire career.